In 1980, while reconstructing the Congress Avenue Bridge in downtown Austin, bridge engineers had no idea that new crevices created beneath the bridge would make an ideal place for a bat roost. Even though they had lived there for years, it was headline news when bats suddenly began moving in under the Austin bridge by the thousands. After the novelty of this unusual occurrence had worn off, the public began to react in fear. Many activists within the Austin community began petitioning to have the colony eradicated. 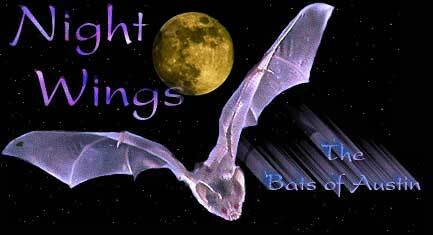 About that time, a group now know as Bat Conservation International, stepped in and began an educational process about the bats. They educated Austinites to the fact that they are gentle and incredibly sophisticated animals, and that they eat from 10,000 to 30,000 pounds of insects, including mosquitoes, each night. The campaign proved to be successful as Austin came to appreciate its bats and even erected a bat sculpture in honor of this unique and spectacular mammal. Since then, the population under the Congress Avenue Bridge has grown to be the largest urban colony in North America. Up to 1.5 million make nightly flights creating a most unusual tourist attraction for Austin. They arrive in mid-March and return to Mexico in early November. They emerge at different times every night, but the hotter and drier the weather gets, the earlier they will get hungry and set out for food. August is the best viewing month, not only because they come out before sundown, but because the newborn bats (called pups) are just beginning to forage with their mothers. Austin's bridge bats are Mexican Free-Tail, which migrate each spring from central Mexico. Most of the colony is female, and in early June each one gives birth to a single pup. The pink, hairless babies grow to be about three to four inches long, with a wingspan of up to a foot. In just five weeks, they'll learn to fly and hunt insects on their own.